It's an old idea that was in my mind for years: making a real periodic table of Mendeleiev (who always fascinate me) in 3D, where in each element box, there is some atoms (at least) of this element. Small recall: Mendeleiev classification elements is from a genious russian chemist at the begining of the 19th century. 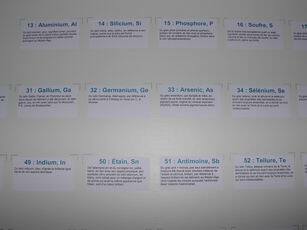 He have the idea to organize all the known elements in a table (with rows and columns) according to their atomic number, i.e. their number of protons. The first one is hydrogen, the second helium, the third lithium, etc. Making is table, Mendeleiev geniously organize rows and columns to project futurs elements, unknows at his time. Elements are from hydrogen (1) to radon (86), there is 71 ones but they are nor regularly cressant: from hydrogen (1) to Lanthane (57), then from hafnium (72) to radon (86). If you want to know more about history of elements, see this page. 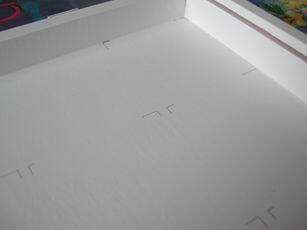 The goal was so to make 3D table, then put information and furnish each boxes with some of the elment. Please note the high quality of the job (my father is a real artist): he also add fixation sytem on top, and a place to insert a window on front to protect the boxes. The 7x7 cm or 2.8x2.8 inches for boxes seems to be a good compromize, there is enough place for writing name of the element and add a small glass pipe with element in. The total size of table is 135x46 cm or 53x18 inches. 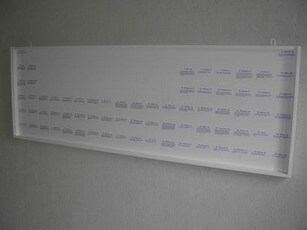 To easily add element name and informations, I use printer labels of 63.5 x 33.9 millimeters. The information on the label is: name (of course), atomic number and a brief description of the origin of the name. Access 2000 with a report/query who automatically print labels. First step, 2 layers of white paint, then using the inside shape to mark labels places with a small line in each up left and right corners, made with lead pencil. Trick: don't do mark boxes against right and left sides, otherwise it's gonna be difficult to erase the lines. Remove the inside shape and stick labels, then erase drawed lines. Table is now ready to receive elements. 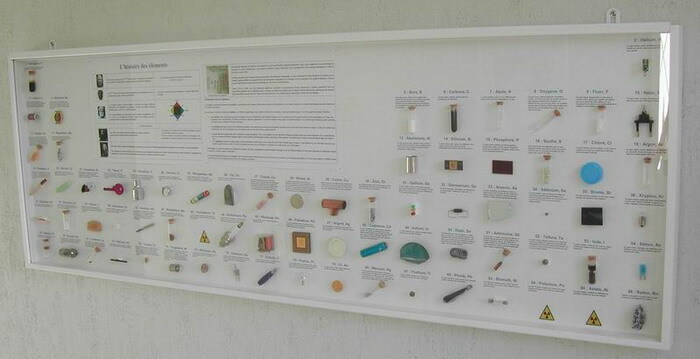 In the center of the table I put some informations about history of elements classifications. To stick them, I use hot glue which could be removed in case of error. To put them, Nanou give me some commercial chemistry small pipes, sometimes re-cut at the right size. You can click on this photo to get details on the choosen objects, and if you want more informations or precision, don't hesitate to contact me. www.periodictableonline.org, Website from belgium in French or dutch : An intercative table where you can click on each element and get all informations about it. There is many informations about the way to find it. Student exercise from Laurent Crochez, chemistry teacher, dedicated to Mendeleïev classification, who friendly choose to be inspired by this experience. Intercative table in flash of Pascal Asmussen from Besançon academy. 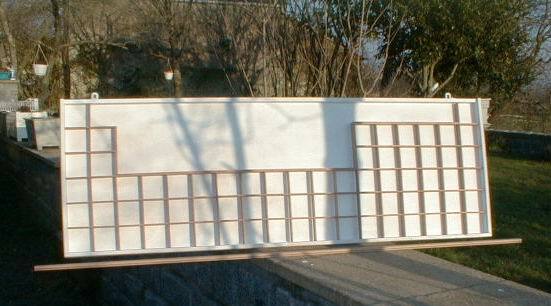 Adviced by Christophe, Theodore Gray website, another periodoc table fan who make and sell them. To all of those who help me, especially in elements hunting, and that are not quoted before: Claude Calvarin from University of Brest, Sophie Prou, Jean Sala Pala and Sylvie Houille from chemistry department, Maurice L'Her from UMR CNRS 6521 laboratory, Frédéric Salach and Gianni Porcellini. THE idea waS excEptionally wonderFul. I will Find a way To make it Happen. i wanT to do this so badly, but im afraid i won't havE ENough time in my work ShedculE, but its fine. i remember learning about Velocity in gradE school. it was very boring theN. it got much more inTeresting in Eighth gradE wheN we learned about life science.